Supporters and detractors alike gave Mexican President-elect Andres Manuel Lopez Obrador a variety of labels during his campaign, including nationalist, populist, protectionist, the Mexican Trump and the anti-Trump. The characterizations, all of which contained at least a sliver of truth, suggested rough times ahead for Mexico's trading partners at a time when the North American Free Trade Agreement appears to be hanging by a thread. 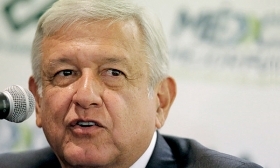 But since his landslide victory on July 1, Lopez Obrador — also known by his initials AMLO — has wasted no time in showing his more pragmatic side by reaching out to his enemies in the business community and taking a half-hour phone call from U.S. President Donald Trump. Lopez Obrador told TV Azteca that he and Trump talked generally about economic development and ways they can work toward being good neighbors. Much to the delight of the business community, the former Mexico City mayor and three-time presidential candidate also embraced NAFTA with gusto during a weeklong media tour. After meeting with outgoing President Enrique Pena Nieto, the president-elect said he will support the current government's approach to the NAFTA talks until his inauguration on Dec. 1. "We are going to work together on the revision of the [trade] agreement," Lopez Obrador said at a news conference, "with the goal of signing a [final] accord." The whirlwind week of "AMLOVE" — the gentler side of the fiery politician that is promoted by supporters on campaign signs and social media — stood in contrast to Trump's consistently hostile outlook toward Mexico and other trading partners, particularly concerning proposed tariffs on imported autos and auto parts. "It's remarkable, it's weird, it's bizarre," said Duncan Wood, head of the Mexico Institute at the Wilson Center in Washington. "You have a Republican president in the U.S. who has a Republican-controlled Congress, and yet the U.S. is being less free-trade friendly than the Mexican president-elect." But it also makes a lot of sense for Lopez Obrador, who has said he wants to lead the nation's "fourth transformation" since independence from Spain by tackling record crime, rampant corruption and endemic poverty. "Even if Andres Manuel doesn't believe in free trade, he knows that Mexico depends on it and has few other options," said Wood. "This is a man who believes very firmly in the idea of Mexico as a project. He sees his presidency in historical terms." That's not to say that Lopez Obrador's honeymoon with Trump will last. Not so long ago, Canadian Prime Minister Justin Trudeau was seen as friendly with Trump, until the two clashed over U.S. steel and aluminum tariffs that took effect June 1. After a monthlong feud, Canada reciprocated with tariffs on American goods. While Lopez Obrador wants to avoid distractions from his domestic agenda, analysts said he's more likely to defend Mexico's honor in the face of attacks than is the current administration, which has been criticized as too subservient. "Andres Manuel really doesn't want to get into a fight with Trump, but if he's provoked, I have no doubt he'll respond," said Wood. "So much of the relationship is actually going to depend on how Trump behaves, whether he sends insulting tweets about Mexicans or Andres Manuel himself, whether he continues to talk about the wall." One area on which the two men agree and could help with NAFTA negotiations is Lopez Obrador's support for higher wages for Mexican auto workers within a renegotiated NAFTA. NAFTA critics in the U.S. and Canada have long pushed for better wage and labour protections for Mexican workers to level the playing field within the trading bloc and stem the southward flow of manufacturing jobs. But the new Mexican leader also ran on a platform of increasing Mexican food production rather than buying so much from places such as the U.S. farm belt, and building more Mexican oil refineries to cut back on the nation's dependence on gasoline from the U.S. gulf coast. That means Lopez Obrador's strain of economic nationalism could clash with Trump's protectionist streak. For now, Lopez Obrador and his transition team are trying to defuse the candidate's running political battles with rival politicians and the business community and the potentially incendiary relationship with Trump. As part of the AMLOVE offensive, Lopez Obrador's future finance minister downplayed any radical changes in government economic policy and expressed optimism that NAFTA talks could be concluded after the U.S. midterm elections. Carlos Urzua, finance chief in Lopez Obrador's Mexico City government in the early 2000s, said the government's current trade negotiators would work with the president-elect's transition team for a seamless handoff of the trade talks. "I think that after the November elections the process could accelerate very rapidly," Urzua told Televisa network. "If everything is ready, it's simply a matter of Trump giving the word to move ahead."